A solemn prologue to their 2000 reunion epic Blood Brothers but that reflection elevates it as the band – long-term veterans of the scene – deliver with an elegiac grace that showcases their brilliant understanding of sonic textures. Iron Maiden may have become known as merchants of taut, punchy metal anthems but bassist and main-man Steve Harris’s roots lie with Genesis. They have evolved to finest purveyors of prog-metal; but it’s hard to deny they are riotously exhilarating and exciting. Touring behind fifteenth album The Final Frontier, Maiden are winding up the final leg, a homecoming in big British venues, having conquered four other continents on their jaunt across the world in custom Boeing-757 Ed Force One (piloted by their frontman, who is also an Olympic-class fencer and novelist). Thirty-five years into their career, they could treat it as an extended victory lap of classics; but Maiden have unshakeable faith in their new material and so split the setlist fifty-fifty between older hits and songs recorded since Dickinson and guitarist Adrian Smith rejoined the band in 1999. On paper, the chosen songs represent a superb set; in practice, they appear to misstep early on. Of the five songs they cull from The Final Frontier, all but one feature in the opening half-hour. The title track packs the pugilistic clout of their eighties heyday; lead single El Dorado insistently gallops off in classic Maiden fashion around the snarling guitar licks of triple-six-string threat Smith, Dave Murray and Janick Gers. But reception is lukewarm from their audience, and when it doesn’t improve after anti-war anthem 2 Minutes to Midnight, alarm bells start ringing. But Maiden pull it back in style. The twisting-prog of The Talisman is superbly rendered, all Celtic-lilts and full-tilt driving bass. Power ballad Coming Home elicits lighters in the air, in a proper heavy-metal throwback. 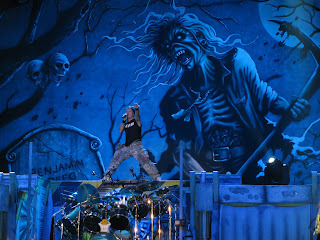 Then comes the breakthrough; a one-two of the gothic Dance of Death and The Trooper, the latter seeing Dickinson prowl the stage in a red military jacket waving a Union Flag like a man possessed. Sheffield erupts into a moshing frenzy and never lets up for the rest of the night. Arguably the best frontman in rock, Dickinson never falters, an energising presence that brings out the best of the crowd throughout. “Scream for me, Yorkshire!” he hollers, before sprinting across the stage, wrestling his microphone during The Wicker Man, his vocals coiled around sharp, brutal riffs. He bleeds passionate sincerity; on sprawling apocalypse opus When the Wild Wind Blows, he is mesmerising. He professionally duals an animatronic Eddie, the band’s iconic mascot, during The Evil That Men Do. 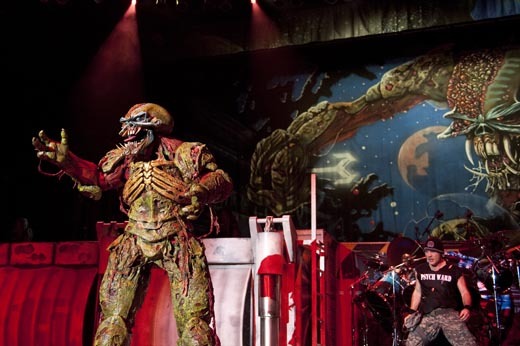 He sometimes strains with the higher notes but during closers Fear of the Dark and Iron Maiden, he rises to the occasion with aplomb, perched upon the stage set (made up like a disused space station) as a giant Eddie head looms ominously behind him. Absolute showmanship is hard to find, but Dickinson taps into a rich seam that is thrillingly entertaining, delivering fire on quintessential Maiden track The Number of the Beast whilst the pummelling drums of Nicko McBrain, kit adorned with Sooty puppet, drives magnum opus Hallowed Be Thy Name forward. They finish with Running Free from their self-titled debut, a rollickingly fun rock-and-roll number. And that’s the key to Maiden’s success; as the house lights come up and Monty Python’s Always Look on the Bright Side of Life blares over the PA, there are mile-wide smiles plastered across the faces of the audience as they head for the exits. 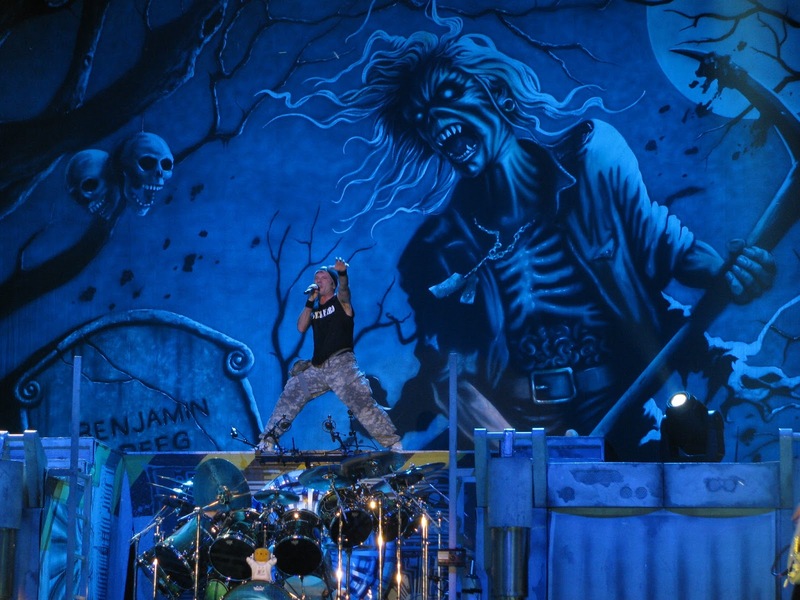 They may have transformed to prog-metal masters; but Iron Maiden know how to have fun. And that’s something music will always need.